Broadcast in the NBC TV program Apollo at 70: A Hot Night In Harlem, 19 June 2004. I have always loved Bob’s gutsy rendition of this important American song. “Blowin’ In The Wind” was one of the inspirations to Sam Cooke. 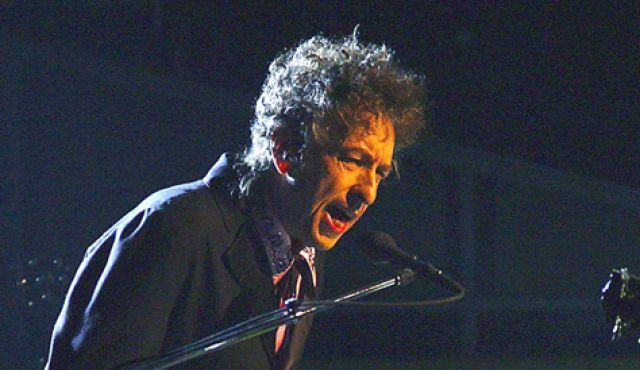 Seemingly, Sam wanted to write a high caliber song about the Civil Rights Movement because Cooke believed that if a white man (Bob Dylan) could write such a statement song (Blowin’ In The Wind), than surely as a black man, he could write as passionate a song and the result was “A Change Gonna Come”. It of course could be a myth, but I found when Bob did this cover, the myth was a bit more of a monument to that time in our histories: musical and political. Every day I enjoy your site as a BobDylan adapt! I saw this already a while ago, but I like not less. Its with my favorite musicians! And Dylan is singing in an outrageous way! Thanks. Always good to see this. One of my favorites. I hadn’t seen that in quite awhile, and never with the introduction before – that was great, thanks! It’s hard to believe that was 10 years ago already.